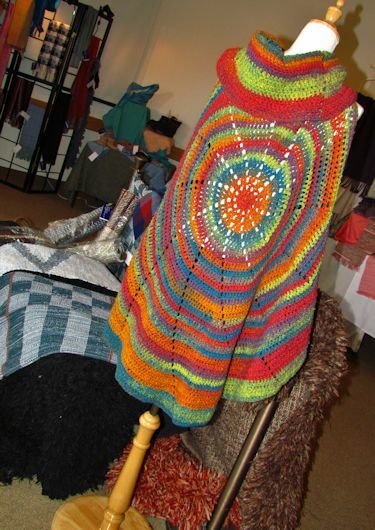 GODERICH – The Huron County Museum played host to the Huron Tract Spinners and Weavers Guild’s annual show and sale this past weekend. The museum was also the location for the Goderich Quilter’s Guild first show and sale. 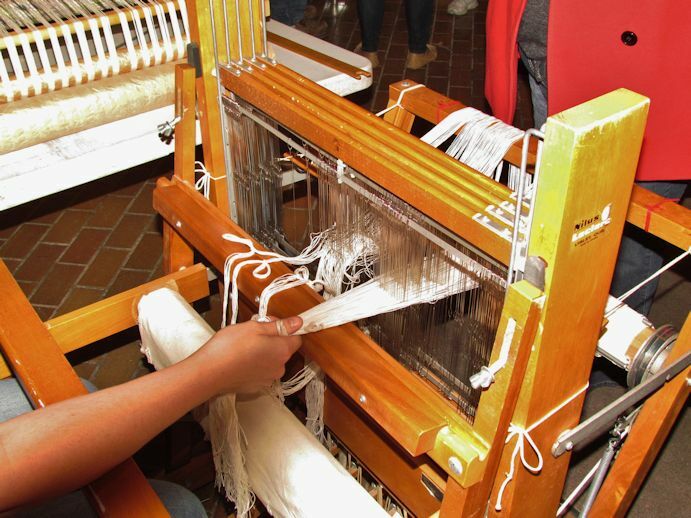 The museum’s foyer featured a variety of small weaving looms along with other spinning and weaving tools and materials. One lady was in the process of threading warp threads onto one of the looms. It all looked very confusing and complicated to me but she assured me that it was not. Then she explained how different patterns were achieved by the way that the machine was threaded, the sequence in which the foot peddles were pressed and the way in which the weft (right to left) thread was used. I nodded my head like I understood but my brain was as knotted as my threads would have been if I had tried to weave! Another young lady, Alana Maaskant, was demonstrating how to spin wool using a foot-pedal operated Louet spinning machine, which is also known as a Dutch spinning machine. With the finished spun wool, she makes slippers with sheepskin lining and leather soles. Sounds cozy and warm. I thought one of the most interesting and unique machines being used was an antique sock-knitting machine known as “the cranker”. Yarn is threaded onto pins on a circular metal tube and then a handle is “cranked”, which somehow spins and threads the yarn into different sized tubes. Monika Kropf was making a thin tube called an I-cord using leftover sock wool. The I-cord will then be used to weave rugs. Apparently these types of machines were often used in the home to make socks for the men who were in the wars overseas. Along with the interesting demonstration of the use of various spinning and weaving machines, there were also a wide variety of hand-crafted articles for sale. Rugs, pillows, bags, scarves, slippers, blankets, jackets, vests and yarn, all in a variety of colours and textures were available. One of my favourite clothing accessories was a lovely cream and brown felted alpaca wool collar. 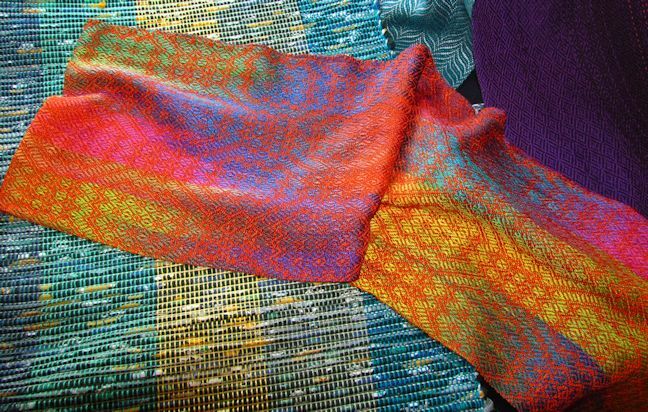 I also loved the stunningly beautiful jewel-toned, hand-dyed, hand-woven, silk scarves. For the cuteness factor there was a felted penguin ornament and kits that you could make your own felted ornaments. The most unique product had to be the hand-felted goat’s milk soap bars – whoda thunk?? Along with the spinning and weaving, there were also demonstrations of quilting. Two ladies were hand-quilting a lovely rainbow coloured quilt that was stretched in a floor frame. Another lady was using a sewing machine to piece together coloured squares for a 9-patch quilt. The walls of the exhibition room were hung with a wide variety of quilts in a kaleidoscope of colours and patterns. 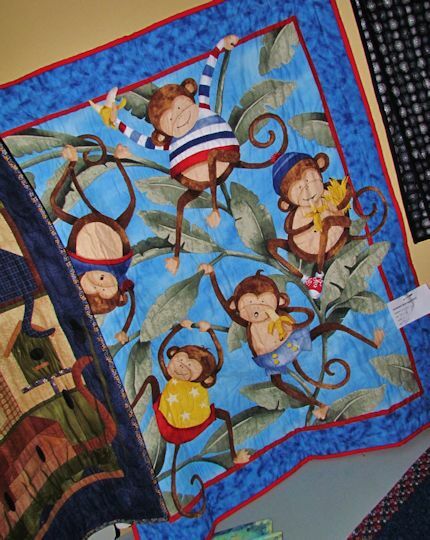 My 18-month-old granddaughter is known as a little monkey so I was particularly drawn to a crib quilt decorated with cheerful monkeys swinging from the trees. I was also amazed by the work that went into creating a lovely reversible quilt with Fall colours on one side and Christmas colours on the other. The Quilt Guild had created a beautiful quilt featuring different piecing and applique techniques. The quilt was being raffled off with a percentage of the proceeds to be donated to the Huron Women’s Shelter. 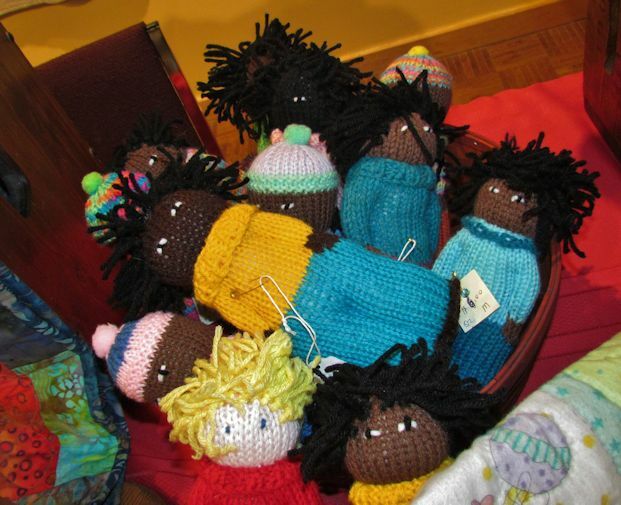 All the wonderful hand-crafted items were certainly a feast for the eyes and a temptation to the pocketbook.